Far Niente Winery was established in 1885 by John Benson, a forty-niner of the California gold rush and uncle of the famous American impressionist painter, Winslow Homer. Benson hired architect Hamden McIntyre, creator of the former Christian Brothers winery—now the Culinary Institute of America at Greystone—to design the building. 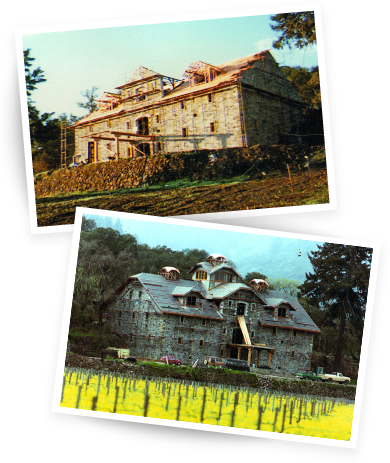 Constructed against a hillside in western Oakville, Far Niente functioned as a gravity flow winery, gently moving the grapes through each stage of production. 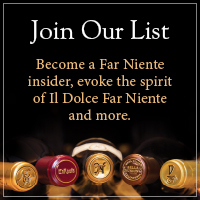 Far Niente’s past and present were reunited in 1998, when a bottle of Far Niente Sweet Muscat, vintage 1886, was discovered in a private cellar in Marin County, California. The bottle exhibits the original label, cork and capsule, and is believed to be the oldest intact bottle of California wine in existence today. The label, featuring a sepia-tone line drawing of a hammock laden with grape clusters, is believed to have been designed by Benson’s nephew, artist Winslow Homer. Historians of the artist liken the style of the hammock on the label to the same technique employed in Homer’s other works. Eric Rudd, a historian and expert on Homer, has explained that while Homer created very little commercial art, he was known to have supplied his work to friends and relations for commercial use, including his cousin, Virginia Johnson. This was the same Virginia Johnson who inherited Far Niente in the early 1900s, from her uncle, John Benson. Today, Far Niente wines carry an intricate art nouveau-style parchment label, which was designed by artist Tom Rodrigues in 1979. Rodrigues also designed the labels for Far Niente’s sister wineries Dolce, Nickel & Nickel and EnRoute, producer of Pinot Noir in the Russian River Valley.